"Innovative Integration between Medicine and Engineering Based on Information Communication Technology"
The GCOE (Global Center of Excellence) program adopted by the Ministry of Education, Culture, Sports, Science and Technology in 2008, "Innovative Integration between Medicine and Engineering Based on Information Communication Technology" (COE Leader: Professor Ryuji Kohno) is in its third year of a planned five years, and in July of 2010, received the highest marks in a mid-term audit. Further developments are taking place such that the critical projects are growing, research findings are being considered for clinical trial and made into international standards. As a Center of Excellence, we streamlined and reduced from 19 to 7 the original critical projects as they grew, as shown in the diagram, further increasing the level of critical focus. For example, a synergistic totality comprising a Body Area Network working as a core, connectivity with the Internet and mobile phone- and satellite communication networks (WINDS), critical projects such as emergency-, preventative- & home healthcare and radiography interpretation working as an extension of the capsule endoscope of an integrated implant BAN, can promisingly evolve into a hyperthermic treatment device with an onboard magnetic resonator, a drug delivery system (DDS) with drug-containing apparatus, or other treatment devices that house nano-laser or a µ manipulator. BAN, which is at the core of the Global COE, is comprised of the world’s highest level of information communication technology (ICT) including the revolutionary UWB radio that has ultra-low power density and does not harm the human body or interfere with devices, and thanks to the Medical ICT Consortium (20 companies and 7 universities) coordinated by National Institute of Information and Communications Technology (NICT), international standardization into IEEE802.15.6 is moving forward, and we anticipate its conclusion before the end of 2011. Parallel to this, prototypes of UWB-BAN (photos right) are undergoing clinical research in anticipation of a clinical trial at the Yokohama City University School of Medicine, one of the affiliate institutions. Furthermore, education and R&D are being carried out with Finland's Oulu University, another affiliated institution, through involvement in international standardization, legislation and commercialization practices of medical ICT. With school regulations being streamlined, YNU and Yokohama City University (YCU) together started a special combined entrance examination for medical & engineering double degree program in 2010. One student who has received a Doctorate in Medicine from YCU was accepted into YNU Graduate School of Engineering as a first such student, and another student that finished a Doctorate Program in Engineering at YNU was accepted into YCU School of Medicine. Thus we now have two double-degree candidates and we are already seeing increased number of applications for next academic year. On March 4, 2011 the 4th Medical ICT Symposium (SMICT 2011) was held at Pacifico Yokohama by the co-sponsorship of Oulu University, Yokohama City University, and the National Institute of Information and Communications Technology. Events such as special lectures (one of which was a pre-recorded video from the United States Food and Drug Administration, FDA), individual presentations, and panel discussions on developing human resources took place, as well as a wide variety of research displays and poster sessions covering topics from BAN technology to tactile technology to telecommunications technology for medical applications. Attended by some 290 participants, the Symposium focused on clinical trials needed for introducing cutting-edge technology to hospitals and clinics, state of the regulatory science that are critical in streamlining regulatory approval processes, and global standardization, which resulted in a wide range of presentations and discussions by doctors, engineers and corporations that are advancing the cutting-edge medicine. People were seen asking and answering questions with enthusiasm and networking in the exhibition- and poster session area as well. The 5th International Symposium on Medical ICT (ISMICT 2011) – the first of which was held in Yokohama – took place March 26-30, 2011 in Montreux, Switzerland with YNU's co-sponsorship. More than 130 presenters in the fields of medicine and engineering convened from 21 countries, giving lectures and taking part in Q&A regarding a wide range of activities related to medical ICT. We were able to tell that ISMICT has matured into an international symposium that brings together concerned parties from Europe, Asia, U.S. and other places. 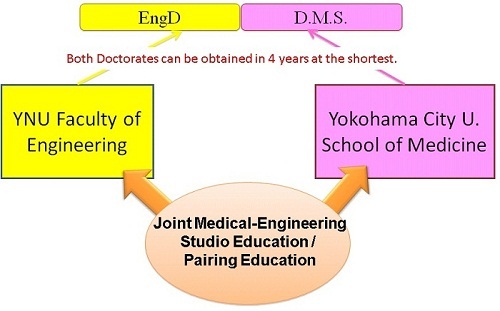 As an evolved form of Global COE, the concept of a coordinated Joint Graduate School (chart right) between Yokohama National University and Yokohama City University is under consideration. By realizing this concept, the planners aspire to make Yokohama rival Boston, U.S.A., as an international city to meld academic disciplines by combining medicine and engineering.